Learn all about wine from a qualified Master of Wine! 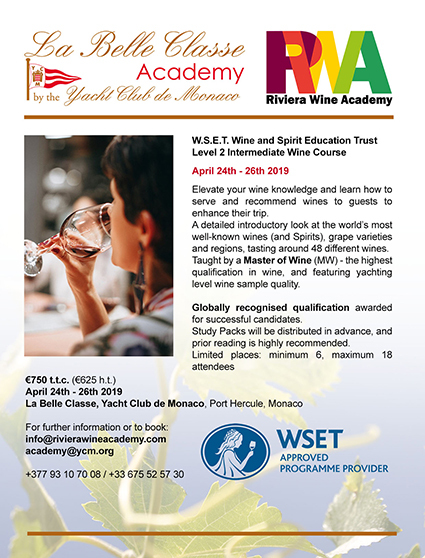 At La Belle Classe Academy, part of the prestigious Yacht Club de Monaco, RWA will offer an amazing three days of wine tasting, learning, and fun. With a globally recognised qualification for all those who pass the exam. €750 t.t.c per person, to include study pack, at least 48 wines and spirits and expert tuition (MW). Limited places - minimum 6, maximum 20 attendees.